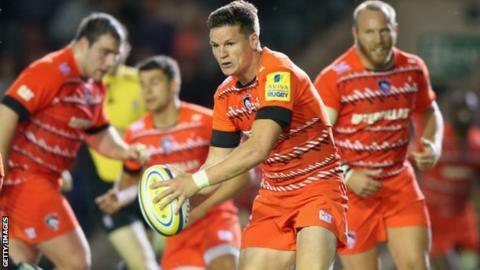 Leicester Tigers have announced an increased turnover and an operating profit of £482,000 for the year ending June 2014. In the 12 months to 30 June 2014, the Tigers' operating profit rose by more than 20%. During the same period, Leicester's turnover increased from £19m to £19.4m. Leicester finished third in last season's Premiership before losing narrowly to Northampton in the play-offs. Club chairman Peter Tom said: "Our significantly improved financial performance in 2013/14 is a tribute to the strength of support for the Leicester Tigers, its relationships with many major commercial partners and to its business strategy. "A strong financial performance also reflects the club's diverse revenue streams." Leicester, who will face Toulon, Scarlets and Ulster in the European Champions Cup, also saw an increase in season ticket holders. "Revenue on match ticket sales was £5.6m and there was a 7% increase in revenue from season tickets, with the number of season ticket holders rising to just under 15,000," Tom added. "The loyalty of our supporters remains at the heart of the club. As attendances continue to grow, the team attracts increasing numbers of family groups and young supporters, and the number of groups from outside our immediate area also reflects the strength of that support."